DAYLIGHT SILENCE is a Heavy Metal/Hard Rock band based in Rome, Italy. 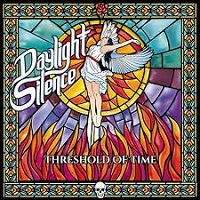 Their current release “Threshold of Time” has a concept album premise to it, and has them portraying themselves as the Daylight Silence Project. A mysterious collection of hackers, terrorists and assassins, set forth into a black hole in a “chronosphere” to redeem their debt’s to society. Set at the “dawn of the fourth millennium”, “Threshold of Time” focuses on a time of social injustices, in which our mysterious expendable musicians are alone the only ones able to save the universe…with their music. Without a doubt, the music is fabulous. But the overall concept is not executed all that well. Perhaps it’s a matter of the theme being lost in the translation. I’m of the opinion that I would have much rather have had Von Braun record the vocals in his native Italian. His English seems forced and affects the overall enjoyment of the album for me. At the same time, the vocals also seem detached from the rest of the band. Perhaps a bit of a production issue. Yet, this band is sensational. The dual guitars of Diablo and Drake swell with power chords, arpeggios and perfectly executed and placed solos. Doctor X and Wolf lay down a subdued and effective foundation. All in all, just an ideal amount of flash backed up by confident talent. The song titles all seem to coincide with the theme of the album’s concept. “Power of Speech”, “Dreaming Of Freedom”, “Live As One” all touch on the topics of social injustice, yet the actual lyrics seem to miss the mark, at least to my ears. Again, I have to think that there’s just something lost in the Italian to English translation. The songs all have a very similar make-up to them, and again, they’re musically executed very well. A highlight for me would be “Power of Speech”, with “Operation Mindcrime” like chants behind the vocals. Double kick drums and a building scorching guitar solo trade-off culminate and then also end the song. “Sleep” is just that, a song that begins with a slower pace before building into the album’s power ballad. The album’s closing track and namesake “Threshold of Time” starts off with guitar effects, and just gets better and better. There is a definite QUEENSRYCHE feel throughout the album, but it really shows itself here. Ultimately, it’s a fun album if you can get past the vocal issues, and if you enjoy the heydays of QUEENSRYCHE, I think this is an album you will like and one you should give a chance.